Renowned Italian tenor Andrea Bocelli has revealed that he was an agnostic as a youngster and that the works of the Russian writer Leo Tolstoy helped him refind his faith. In an interview published in the current UK edition of The Big Issues magazine, the 60-year-old singer said that “some pressing existential questions cropped up” for him as an adult. Leo Tolstoy experienced a profound moral crisis, followed by a profound spiritual awakening, and wrote about this in his non-fiction work ‘A Confession’, published in 1882. His interpretation of the ethical teachings of Jesus, centring on the Sermon on the Mount, caused him to become a fervent Christian anarchist and pacifist. Tolstoy’s ideas on nonviolent resistance, expressed in such works as The Kingdom of God Is Within You (1894), were to have a profound impact on 20th century figures such as Gandhi and Martin Luther King, Jr. The Russian writer is best known for the novels War and Peace (1869) and Anna Karenina (1877), often cited as pinnacles of realist fiction. He also wrote plays and numerous philosophical essays. Elsewhere in his interview with The Big Issues, Andrea Bocelli recalled he was “a very vivacious teenager, even a bit naughty, always willing to crack a joke and have a laugh”. He said his family was “a united and peaceful family. Love always prevailed, mutual fondness softened any kind of friction that might have emerged. “I owe my parents an awful lot. My father Sandro and my mother Edi moulded my character, offering me an education that was invaluable during my whole life. Among the many teachings I received, I would mention the determination not to give up. Speaking of his relationship with his father, he explained: “My father and I were very similar in character. We were both strong-natured and we have argued over time. Even though there was never any family opposition to my passion for music my father did not think I could succeed and be able to support myself relying only on my voice. He used to say if you enjoy it, sing but you must first get an education! He also used to try and restrain my youthful eagerness (and sometimes my recklessness) with his fatherly love and typical parental apprehension that I only understood later once I became a father myself. Andrea Bocelli first performed for Pope John Paul II in 1994 after he returned to the practice of his faith as a Catholic. Since then, he has performed for the Pontiff on a number of occasions, most recently for Pope Francis at the World Meeting of Families in Dublin in August 2018. On 20 September 2018, Bocelli released a new single ‘Fall On Me’ in which he collaborated with his son, Matteo Bocelli. The song features on his album, ‘Sì’, which was released in autumn 2018. 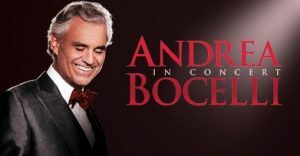 See andreabocelli.com.